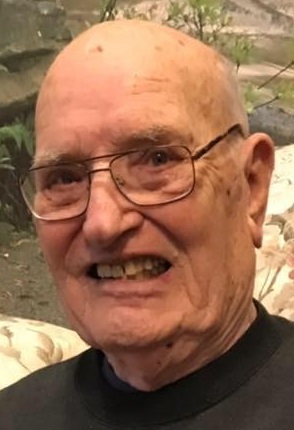 James H. Smith, 91, of Kittanning was called home to the Lord on Saturday, March 30, 2019 at Armstrong County Memorial Hospital. He was born on December 24, 1927, to Velmer H. Smith and Myrna M. (Cunningham) Smith in Garretts Run, PA.
Jim retired from Alltel after 45 years of service. He proudly served his country in the U.S Navy during both WWII and the Korean Conflict. Jim was a member of the Union Ave. United Methodist Church in Kittanning. He was also a 32nd degree mason and belonged to the New Castle Consistory. Jim had quite an affection for many hobbies to keep him busy. He would tinker with just about anything and he enjoyed woodworking. He is survived by his loving wife, Beatrice J. (Febinger) Smith whom he married on November 29, 1947 , and just celebrated 71 years of marriage; his daughter, Sandra J. Ashley and husband Robert; 5 grandchildren- James E. Smith and wife Andrea, Pamela J. White and husband Ronald, Brian R. Ashley and wife Teresa, Amber D. Hornburg and husband Michael, Brett A. Ashley and wife Lauren; and 11 great-grandchildren. He was preceded in death by his parents, sons, Larry J. Smith and Jeffrey A. Smith; brother, Kenneth D. Smith. Family and friends will be received on Monday April 1, 2019 in the Snyder-Crissman Funeral Home, 200 South McKean St., Kittanning, PA 16201 from 5:00pm to 8:00pm. Funeral services will take place on Tuesday April 2, 2019 in the Union Ave. United Methodist Church at 10:00am with Rev. Douglas E. Dorula officiating. Burial with military honors will follow in the Kittanning Cemetery.